You can check in to the Grand Canyon Railway Hotel any time after 3:00 p.m. Mountain Time. 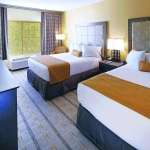 Check-out is 11:00 a.m.
Wireless Internet access is complimentary for all guests staying at the Grand Canyon Railway Hotel. The hotel also provides free parking. Designed to resemble the century-old train depot that housed the original Fray Marcos Hotel—which was opened by the Santa Fe Railroad as a Harvey House—the Grand Canyon Railway Hotel is your ideal choice before embarking for Grand Canyon National Park. 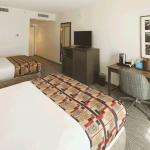 Our guest rooms feature triple sheeting, numerous amenities like free WiFi and offer a choice between standard rooms, deluxe rooms, suites, and of course, the Rail Baron Suite. 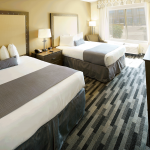 See for yourself why we were awarded the Certificate of Excellence from Trip Advisor! 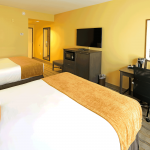 Recently renovated in 2014 & 2016, our Standard rooms feature two triple-sheeted queen beds, flat-screen satellite TV with Starz Movie Channel, complimentary wi-fi, upgraded custom furnishings, and full-length mirror and desk. 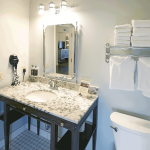 The rooms also have a mini-fridge, in-room Keurig coffee maker, telephone, alarm clock, air conditioning, and a fully remodeled bathroom with granite counter tops, and hairdryer. 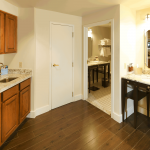 Standard rooms are a spacious 300+ square feet. Occupancy: 5 people maximum (4 adults). 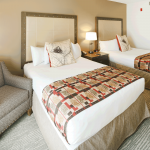 Newly refurbished in 2017, our tastefully decorated Deluxe rooms feature two queen beds that have triple-sheet bedding and Queen size down pillows. 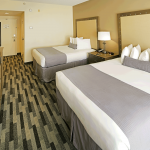 These spacious rooms have complimentary wi-fi, wall-mounted flat screen satellite TVs with Starz Movie Channel, new custom furniture, full-length mirror, desk and completely refurbished bathrooms that feature granite counter tops with sleek Moen fixtures, personal scale, and hair dryer. 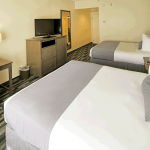 Rooms also include Keurig coffee makers, microwave oven, mini-fridges, desks, alarm clocks and more. Occupancy: 5 people maximum (4 adults). 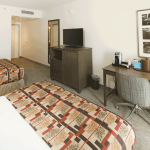 Grand Canyon Railway Hotel has 10 Suites adorned in contemporary decor and furniture featuring a modern style with railroad finishes. 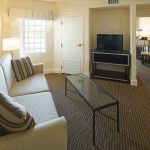 Each suite is a lovely 550+ square feet, and has a separate living area with a plush couch and pull-out sleeper, chair and flat screen satellite TVs with Starz Movie Channel, as well as a kitchenette with microwave, mini-refrigerator, coffee maker, and sink. 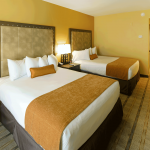 Bedrooms feature two comfortable queen beds with triple sheet bedding, down comforter and queen down pillows, flat screen satellite TV with Starz Movie Channel, full-length mirror, desk, alarm clock, and air conditioning. 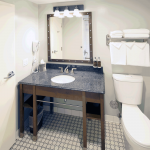 A spacious full bathroom with granite counter tops, hair dryer, personal scales and individual terrycloth robes also awaits you. Occupancy: 6 people maximum (4 adults). 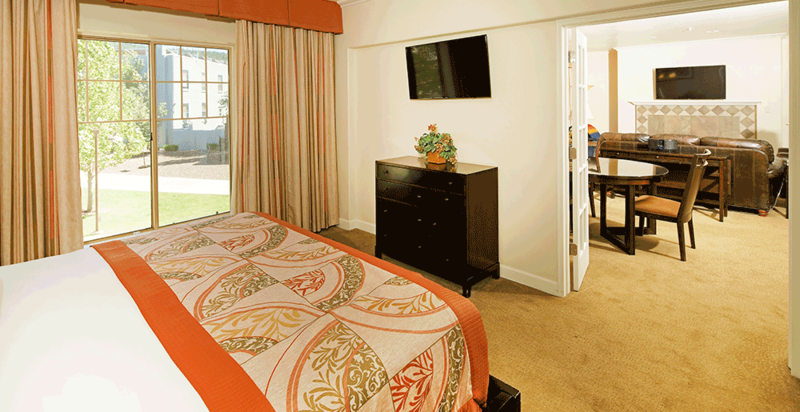 There is one special room at the Grand Canyon Railway Hotel, reserved for our most exclusive guests. 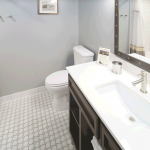 Originally designed for former owners Max & Thelma Biegert, you may not own the railroad, but you’ll feel like you did. 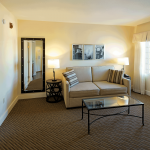 The luxurious suite is 1,000 square feet+ and features a spacious living room with personal sound system, 50” TV and leather furniture, full kitchen with granite countertops, stainless steel appliances, breakfast bar and full size dining table. 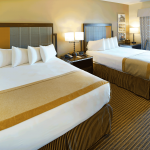 The bedroom features a plush king size bed, down comforter and flat screen TV. 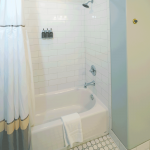 The bathroom has individual terrycloth robes, hair dryer, lighted mirror and personal scales. 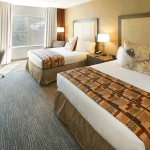 Designed for discriminating tastes, this well-appointed suite is the perfect retreat before embarking for the canyon. Live like a rail baron while you stay at the Grand Canyon Railway Hotel. Occupancy: 2 adults maximum. 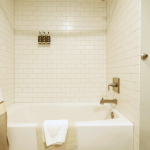 We provide a number of accessible rooms at The Railway Hotel. 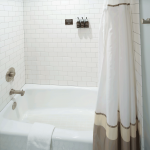 These accessible rooms are equipped with roll-in showers. For additional details, please click here or call Central Reservations at (800) 843-8724 (7a-7p MT).